Up: Looks as sporty as it is, Snapper Rocks Blue paint. Down: It can get spendy… almost too spendy. Neutral: This is the car that $30,000 sports cars want to be. In 2013 BMW released a car that would end the confused consumer’s misery of ordering a 3-Series sedan and having a 3-Series coupe show up instead. The world was filled with bewildered buyers not knowing which BMW they would actually receive on delivery day. Angry lines were bursting from dealership doors and the masses were begging for an answer to end their car purchasing torment. BMW had to think fast or risk losing customers. What they came up with was the 4-Series. BMW did come up with a 4-Series but it wasn’t due to the chaos from incorrect orders. It was mostly part of an effort at BMW to fill in the missing gaps in their lineup that they’ve had for over 40 years. Before 2013, you could only own a 3, 5, 6, 7, and, in some cases, a 1-Series. BMW has since added the 2-series, which is a smaller 3-Series coupe, and a 4-Series, which fundamentally is the new 3-Series coupe. But I’m meandering. 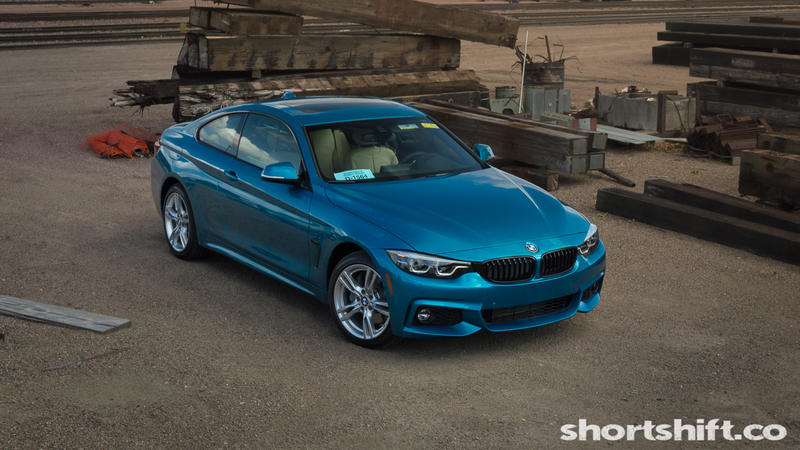 Whatever BMW’s logic is, when you see a a 2018 BMW 430i xDrive in Snapper Rocks Blue Metallic on the lot, you will gravitate towards it. I had driven both the 7-Series and the 5-Series in one day and just as I was about to return those keys I spotted this out of the corner of my eye. I had to ask to review it. It’s a striking looking car with a color that’s hard to capture in photos. It’s also a ton of fun to drive. On the outside you’ll see that the 2018 430i xDrive bares a lot of the signature BMW features; same grille, strong body line, “L” shaped taillights, and those signature halogen lights. But the 4-Series also has a look of it’s own. The proportions are sharp and even, the stance is low and wide, and it looks sporty from every angle. But it’s hard to talk about this particular car without mentioning the color. The 4-Series comes in your typical shades of greys, whites, blacks, silvers, and reds, but new to 2018 is Snapper Rocks Blue Metallic. It’s an eye catching blue that sparkles in the sun and almost gives off a green tint in the right amount of sun. In my opinion, the only crazier color that BMW offers is the Austin Yellow Metallic on the M3 and M4. The 430i xDrive is the low-midrange model but has quite a bit of sportiness to offer. With a 248 horsepower twin-turbo 2.0 liter inline-4 engine, it’s one of only a few 4-bangers that come with TWO turbos tacked on from the factory! It also comes coupled with BMW’s famous xDrive AWD system which can send power to any wheel it needs to and, in some cases, up to 100% to the rear. That makes for one hell of a fun car all year round. The 430i isn’t a supercar by any means, or even similar to it’s big brother the M4, but it is faster than a Golf GTI, has AWD, 2-doors, and paddle shifters. But it’s also more expensive than a Golf GTI. Like, double. The base 430i costs around $44,000 but the one I tested had some cool packages added on. Unfortunately, they do add up. First it came with the “M Sport Package” which is a must have on the 4-Series. That runs $2,600 but gives you the signature sporty BMW front bumper, 18″ StarSpoke wheels, M steering wheel, sport seats, and a whole mess of “M” badges throughout. This 430i xDrive also comes equipped with the Essentials, Premium, and Executive packages which offer comforts such as keyless entry, adaptive LED lights, navigation, heads-up display, side/top view cameras, and more. They are $1,450, $2,300, and $2,100 respectively. Add in the cost of the unique paint color and some extras, that brings the total cost of this 2018 BMW 430i xDrive up to $57,075! So is it worth that much? Would you pay almost $60,000 for a 250 horsepower coupe? Let’s take into consideration some of it’s competitors that are half the price. There is the Toyobaru BRZ/GT86 that are both RWD coupes with 200 hp, but don’t offer nearly the amount of performance and creature comforts. Then there are hot hatches such as the GTI, Focus ST, Golf R, Focus RS, etc, that do offer some of the performance, but don’t give you the sleek coupe design with luxurious BMW materials. It really comes down to your price point and what you’re looking for, but the 430i really is a cut above the rest. I had a blast during my time with the 2018 BMW 430i xDrive. I’ve driven cars that are way faster and way slower than this one but I can honestly say that the 430i is just plain fun. It looks great, sounds good, and makes you feel like you made the right purchase. Sure you pay a premium for the BMW badging, but you’ll be reassured any time you pull up next to a Subaru BRZ or Ford Focus ST at the stoplight. And if that doesn’t convince you, just look at that Snapper Rocks Blue color!